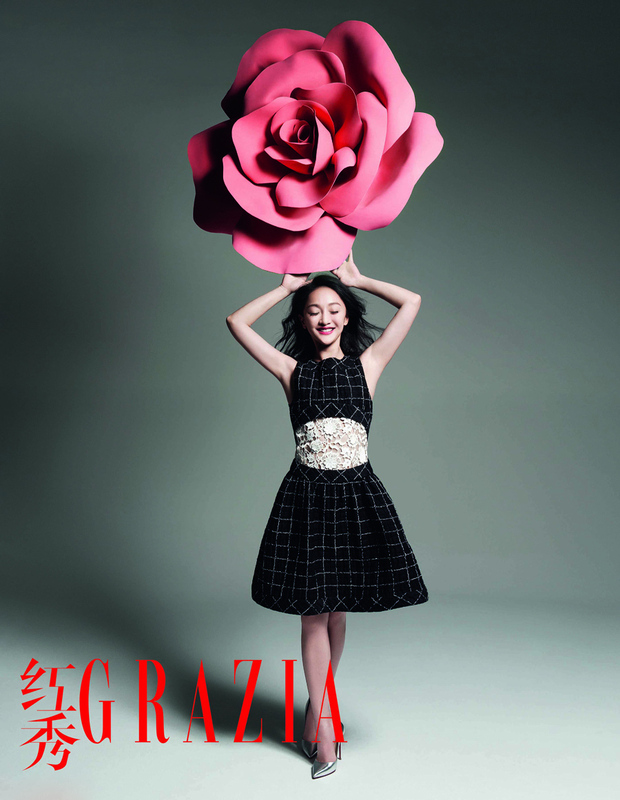 Zhou Xun shows off her exuberant side in this colorful editorial for Grazia China. The charismatic 39 year old actress is currently filming "My Menopausal Girl" a romantic comedy about a woman dealing with premature menopause. I'd be curious to see how they find the humor in this type of situation. The film costars Tong Dawei as her boyfriend and is being directed by South Korean director Kwak Jae Yong who is best known for the popular 2001 hit My Sassy Girl which propelled Jeon Ji Hyun to fame. That was such a fun movie which I'd totally recommend. There was even an American remake. Everything about this editorial is just so fresh and pretty from her grooming to the styling. It's such a transformation from how she looked in this moody Marie Claire pictorial which was beautiful in a totally different way. In any case I love her hair in both. Zhou Xun looks really young for a 39 year old! Even after taking into account how Asians seem to look younger. By the way, I saw in your bio that your fave book is The Little Prince- that's one of my favourites too! Would you have any other book recommendations? There certainly is such a light and airy feel to this editorial. That last such is just stunning. What!? 39!? I need some of what she's using! The film sounds interesting. She's very pretty, and I adore all things bows, so that outfit in black and white is my favourite. Great editorial, especially with the pink backdrop. Have a lovely weekend Rowena! Elegant and beautiful awesome post thanks for sharing doll. Have a great weekend. Being 39 and still looking hot and pretty, what more can a girl asked for? She's definitely one who I like to just stare and think she looks like a doll. She is adorable and the fuchsia lipstick just sings of spring! Have a lovely weekend dear! Darling dresses and seriously how great is her skin? Wow I wish I look as fab as her when I reach 39. She looks like a girl in late 20's. Love..love..love her hair. oh my gosh she is not 39! she's so beautiful. and so awesome of her to take on such a role. i would imagine that certain actresses wouldn't want to take on roles that may look "bad". This woman is stunning! I love your site because it's the only one I follow with Asian beauty role-models! I need more! It's challenging being half Asian and half Caucasian when it comes to beauty inspiration! I love seeing both sides! Have a wonderful weekend, Rowena! I think I fixed my no-reply comment thing! I can not believe she's 39, she looks flawless! She has such a girly, pretty style! 39 years old??? She is wonderful!!!!! She is so cute! She looks way younger. Have a great weekend! Keep up this great style! That sounds hilarious so interesting was always associated with being "over the hill" funny how they are now focusing on a younger women with peri-menpuase. Love the colors in this editorial. Have a sweet weekend babe. Wow, she's so beautiful and I definitely like her style. That sweater is adorable. There is no way Zhou is 39!! She barely looks over 21. Rowena, please tell me whats the secret of staying so youthful, Asian stars/people are so beautifully blessed with this gene! Love this fun and pretty editorial. Thanks so much for kindly stopping by...I see what you mean about the coloring. wishing you a marvelous weekend! Gorgeous girl and gorgeous photos!!! Have a lovely weekend, Rowena! Hi Rowena! You always pick perfect eye-candies. She is a beauty and looks nice too! Happy weekend dear! Ooo, I loved that sequined number she's wearing - so pretty! Oh very cute pis, thanks for share the scans! That last photo is priceless. I love the different designs she's wearing and their incorporation of flowers. Very spring! Very fresh! FUN! Gorgeous lady! Hope you are having a great weekend! She's gorgeous actress c: and I can't believe she's almost 40! My menopausal girl? That sounds so funny/grossly in depth. 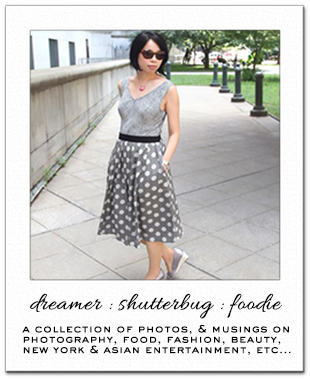 Thanks for commenting on my blog with a few details about you! I'm Korean but I don't speak the language very well. Funnily enough, my Mum says all Korean dramas are predictable and my parents are loving all the American dramas I am recommending. You say the Chinese ones are predictable and you're enjoying the Korean ones, so maybe I should check out a few Chinese ones and see if I think the same. I live in England but they don't do too many dramas - I absolutely love American ones and my faves are Grey's Anatomy, The Good Wife, One Tree Hill, Friends….ahhh too many to mention! I'm sure I will be doing a post on them soon. Haven't tried out Desperate Housewives yet but something tells me I will enjoy. No way - 39?! And yes, I loved My Sassy Girl too. I've actually been told that I look (act) like that girl too - eeps!